The second story is a 6-page short but it's a pretty good story, featuring Wonder Woman's longtime nemesis, Angle-Man. 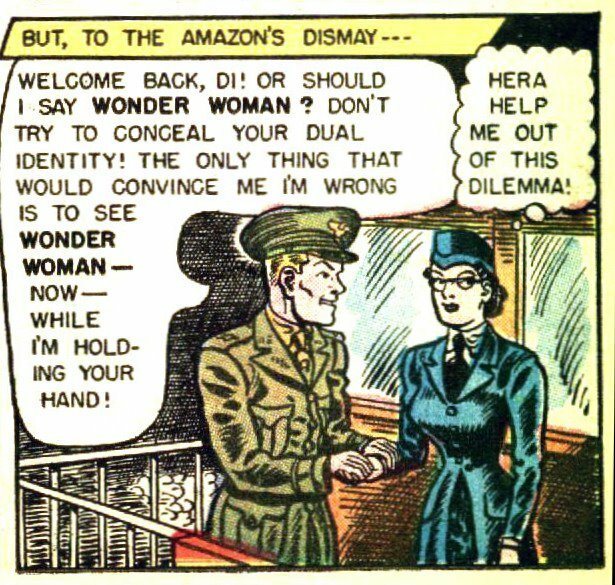 He tapes Wonder Woman commanding her invisible plane, then uses the recordings to prevent the plane from helping WW. 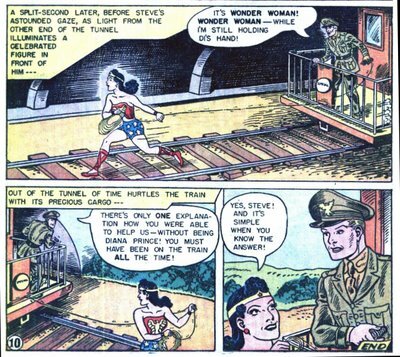 Wonder Woman foils a criminal circus gang in the third story. This is arguably outside the normal realm of this blog, as it was published by ACG in 1954. During a brief era of popularity for 3-D comics, ACG came up with an interesting process that didn't require glasses. The effect used several tricks. First, the extension of the drawings outside the frame appears more obvious with the black pages. Second, people are drawn in bright colors while backgrounds are pastels or light greys. Not terribly difficult but it was a nice break from the glasses of the era. I skipped over the annuals in the discussion of the Ditko Spiderman, so I thought I'd take a quick rowback and rectify that situation. Annuals had appeared in comics going back to the Golden Age, but DC really got things going in the 1960s with Superman Annual #1. Despite the name, the comics were so successful that DC issued some of the annuals on both a Winter and Summer basis. I suspect a good reason for the success of the annuals is that they were often whim purchases by parents looking for something to keep the kids busy during a long drive. I know in my own family that was often the case as Mom would hand me three quarters and tell me to get a couple of the big comics and some candy bars (weren't those the days) before we'd take the four hour drive to Aunt Bev's cottage on the lake. But with Spiderman Annual #1, in 1964, there was a slight problem for Marvel. They had no old Spiderman stories to reprint, so they decided to create a new, extra-length story with Spidey facing a group of his old foes, banded together (yet separate) called the Sinister Six. Overall the story would be pretty insignificant, but for one small detail. The leader of the Sinister Six was Dr. Octopus. 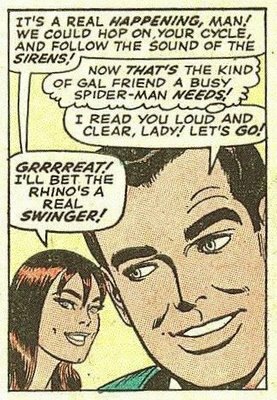 In order to put his plan into operation, he kidnaps Betty Brant from a street corner. Worse, Aunt May happens to be talking to Betty at the time and thus must be abducted as well. This chance meeting between Aunt May and Doc Ock would cause endless consequences for Peter down the road. The Sinister Six included Sandman, Kraven, Electro, Vulture, and Mysterio in additon to Dr Octopus. Interestingly, the Green Goblin is not included. The battles are miniatures, with some only taking a page or two. Doc Ock is clearly Spiderman's greatest enemy at this point. And there's an interesting pop culture reference. At the end Aunt May gets upset when she realizes that while she was out she missed the Beverly Hillbillies. In 1964 the Beverly Hillbillies became the only TV show to be #1 in its first season, and was a genuine phenomenon, although I suspect that had more to do with Boomer kids than old ladies in Forest Hills. 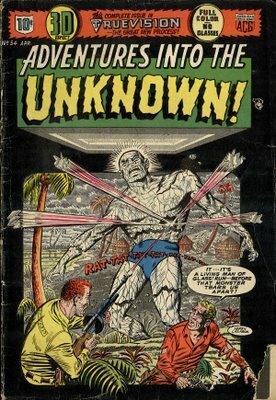 American Comics Group was a long-lived company, lasting from the Golden Age right up to the end of the Silver Age. 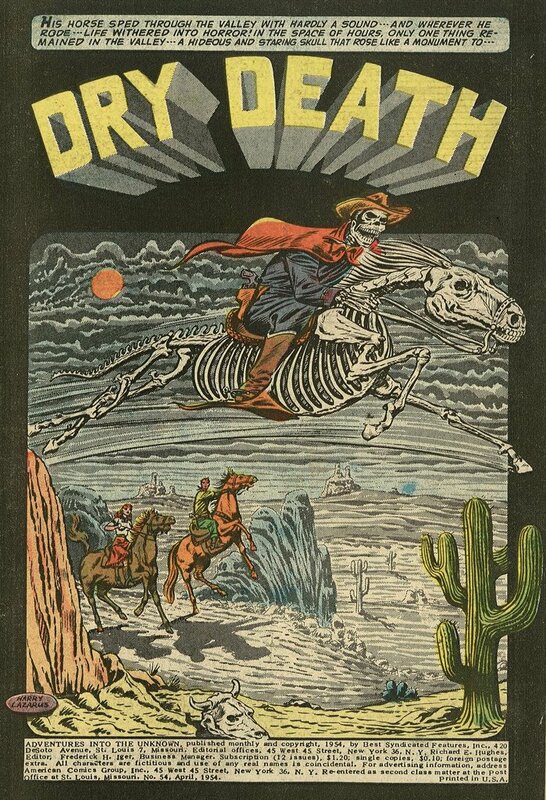 At various times, they carried almost every comics genre--Funny Animal, Horror, Science Fiction, War, Western, Teen, Romance, etc. But oddly the one genre they'd stayed away from for almost 20 years was Superhero. 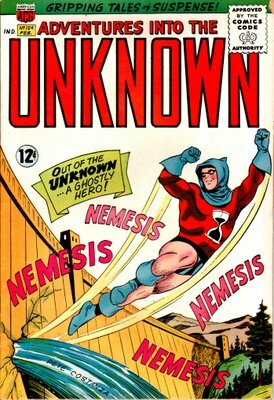 That changed in the mid-60s with Adventures into the Unknown #152, February 1965, featuring the arrival of Nemesis. Nemesis was Steve Flint, an ace private investigator. He had been fighting the Mafia, who were attempting to sabotage a moon rocket attempt. 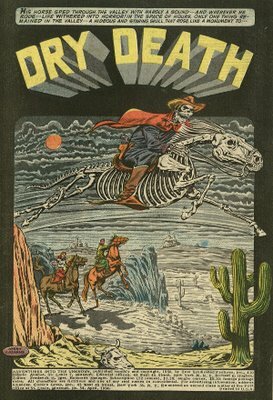 Killed by the mobsters, he convinces the Grim Reaper to send him back to Earth from "the Unknown" (which bears a striking resemblance to heaven). 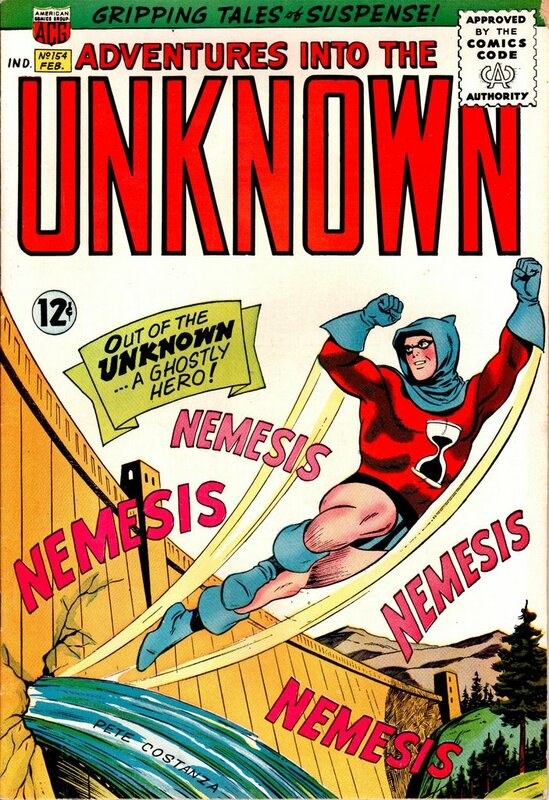 Being non-mortal, Nemesis can fly, has great strength, and is invulnerable to harm. Nemesis succeeds where Flint couldn't and eventually the leader of the Mafia, Goratti, dies in battle with him. However, interestingly enough, Goratti is not finished, since now he resides in "the Unknown" as well. The series lasted for two years before finally giving up the ghost after #170. 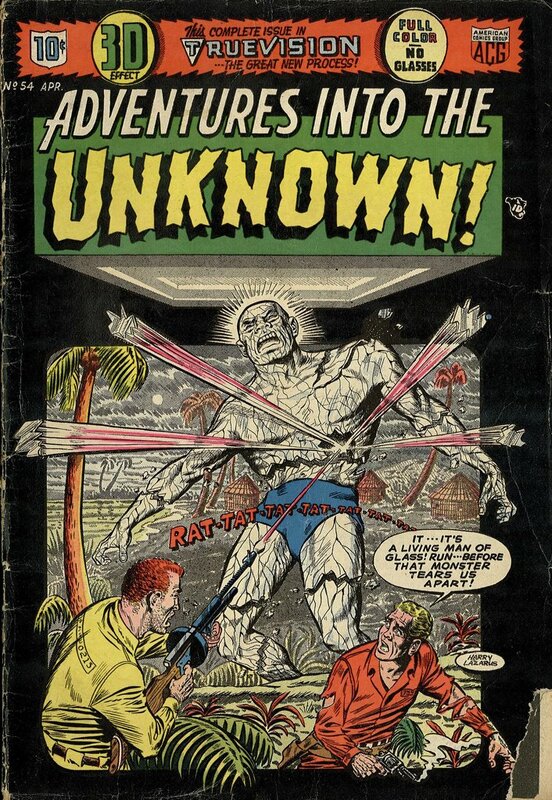 Adventures into the Unknown lasted until #174 before expiring itself along with American Comics Group. 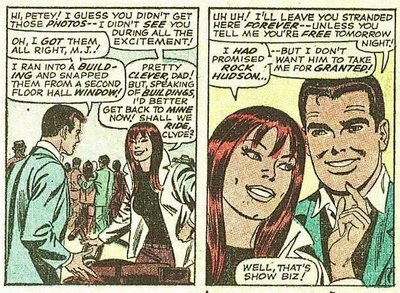 Of course, based on what we know now, Rock would rather have been dating Peter. 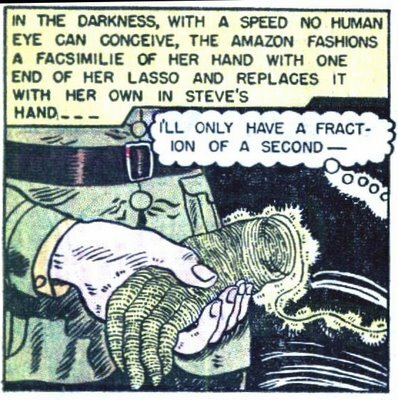 Perhaps an early omen of the "relevant" comics of the later 1960s? But fortunately, Stan didn't let the soap opera aspects of his comics reduce the number of punches thrown between Spidey and his enemies. ASM #43 features the return of the Rhino, once again after JJJ's son (apparently unaware that Spiderman has killed the space spores that made him valuable). But Spidey manages to destroy his hard skin with a special type of webbing that Dr Curt Connors (aka the Lizard) has helped devise. In the next issue Peter is at Grand Central when he spots Dr Connors, who looks troubled. Sure, enough, the doc dashes off as he feels the transformation back into the Lizard coming on. Once again his dreams of conquering the world with lizards like him resumes. Spidey's left arm is hurt in his first battle with the Lizard, and it's put in a sling. This causes him continuing trouble for the next few issues; just another example of throwing rocks at the hero. Spiderman has a climactic battle in the railroad yards with the Lizard. In a moment of inspiration, he angers the reptile, who follows him into a refrigerated car. The cold-blooded creature soon is powerless, and Spiderman is able to take him back to New York and give him an antidote. But it's on the personal side that some of the most interesting stuff happens. 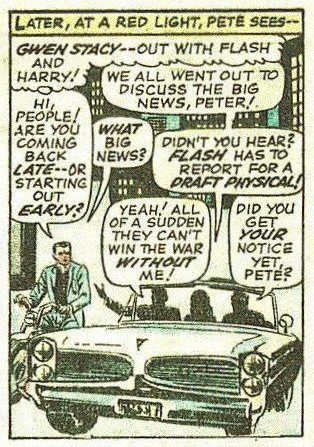 As noted above, Flash Thompson is drafted into the army, a jarring reminder of how old these comics are, since nobody's been drafted since 1972. Betty Brant and Ned Leeds get engaged. 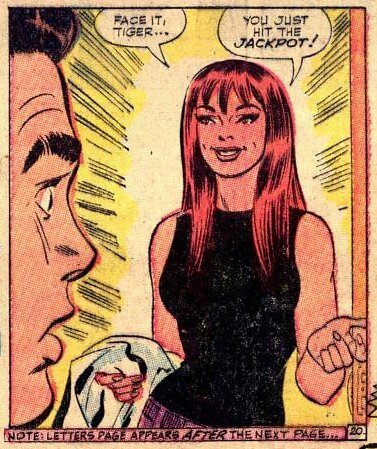 And Peter's budding interest in Gwen Stacy is thrown for a loop by the arrival of Mary Jane. Harry Osborn goes out of his way to be more friendly to Peter, setting the stage for the next big change in Peter's life. With Romita taking over on the art chores two issues earlier, Amazing Spiderman began a new direction with #41. Peter begins to show increasing maturity. He purchases a small scooter to get around town. 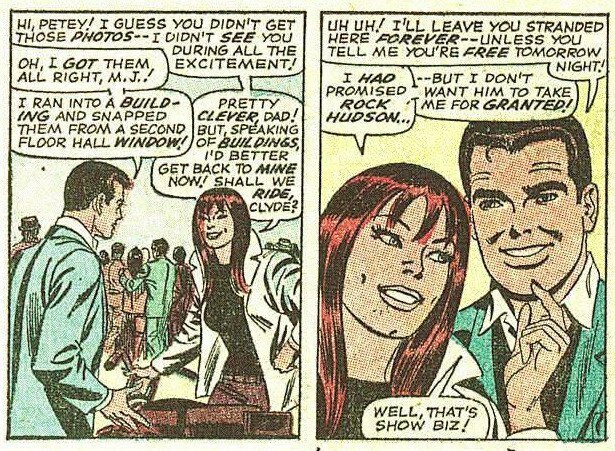 He also runs into Betty Brant and realizes he no longer has anything in common with her. 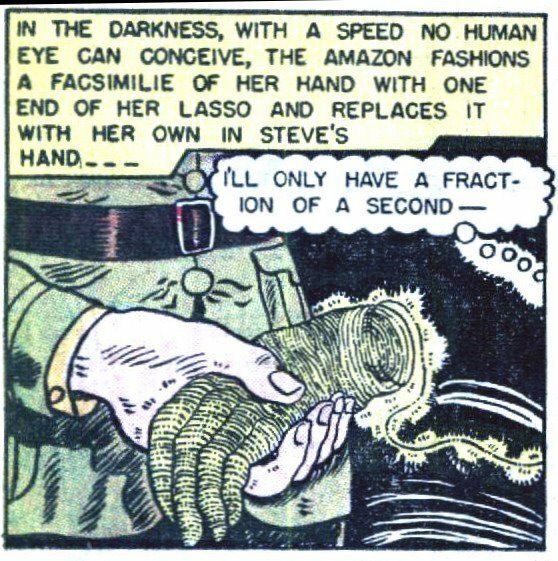 But of course, the supervillains keep coming. A new one is introduced in this issue: The Rhino. JJJ's son, the astronaut (last seen way back in ASM #1) was affected by some space spores during his last mission and the commies would love to get their hands on him. The Rhino is obviously working for them. However, his battle with Spidey's rather dull; Peter just tires the Rhino out and wins by default. We don't learn his origin, or how he got that armor-plated skin and horn. Peter rescues John Jameson, but needless to say, his dad isn't satisfied that Spidey's not the real villain. In ASM #42, we learn that the spores Jameson's son was exposed to have had a delayed effect, turning him to an ultra-strong and invincible superhero. In the meantime, Spiderman has apparently gone bad, robbing a bank in broad daylight. Hearing this JJJ decides that his son should be the one to bring in Spidey. We also see Peter and Gwen starting to show sparks of interest for each other. Later, Spiderman has a short battle with JJJ's son before getting away. In a flashback, we learn that Peter had been in the bank when he realized that one of the money bags being carried by a gun was ticking. Hence his robbery was really just getting rid of a bomb. When JJJ discovers this, he tries to call his son off the chase. 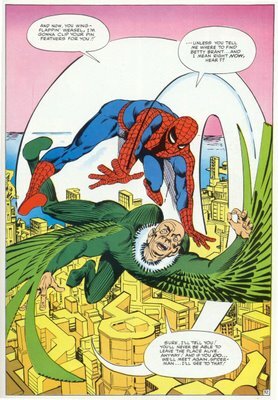 But John Jameson is no longer rational; he's determined to defeat Spidey whether he robbed the bank or not. But Spidey defeats him by knocking him into an electrical dynamo which kills the spores and returns the astronaut to his normal self.